I've developed a new morning routine in the past couple of months. First thing after I wake up in the morning, I stay in bed as long as possible. It's a great way to start the day. You should try it. When I absolutely have to get out of bed, I do. After that, I make sure Bubby at least has the opportunity to eat something, then Bubby and I head out to the bus stop. By the way friends, something that is saving my life these days is alarms. I set an alarm to tell me when to make sure Bubby is awake. I set an alarm to remind me to ask him if he's hungry. I set an alarm to tell us to head out the door to the bus. I also have night time alarms. If you are having trouble remembering to do something on a daily basis, set an alarm. On most devices, you can name alarms, so you don't even have to remember what the alarm is for. Anyway, after Bubby gets on the bus, I walk back to the house, grab my Bible and prayer journal, and head out to the chicken coop. Sometimes I let the girls out, sometimes I don't, but I always pull up a chair and make myself comfortable. It was 8°F that morning. At this point, you probably have lots of questions. Or maybe just one question: why? 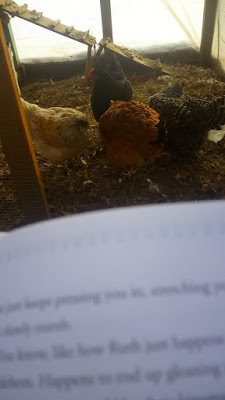 I started doing devotions with the chickens at the end of November, because I had been hearing, from multiple sources, that early morning exposure to natural light is an important factor in keeping circadian rhythms intact. And circadian rhythms have an impact on seasonal depression, or lack of thereof. For the past several years, I've noticed that the darkness of November and December get to me. In not a good way. So I figured I'd give early morning natural light a try. At the same time, I've struggled for years to make Bible study a daily habit. I've gone through study spurts through the years, but it never sticks long term. 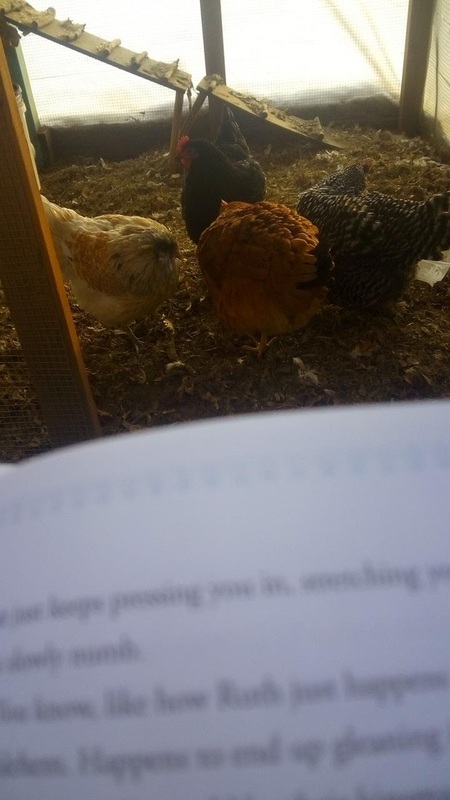 So I decided to combine Bible study with natural light and throw in some (therapy) chickens for good measure. So that's why I bundle up every weekday morning and head out to read to the chickens. I'm not sure how much natural light I'm actually getting, since it's usually cloudy, but whatever. I think it's helping. And the girls love hanging out with me. The feeling is mutual. After about 20-30 minutes of devotion and prayer with the chickens, I head inside and grab my water bottle. And then I head to the World Dance Floor. You guys. I am just a teensy weensy bit obsessed with Just Dance. My kiddos gave me the 2019 Xbox One edition, but it doesn't matter. I bet I'd be enamored with any of them. I thought I would have fun with it, but I didn't think I'd be dancing for an hour or two every day while the kids are in school. You heard me. An hour or two. And I had never heard of probably 75% of the songs before I got the game. And I am not a natural or graceful dancer. But it is just. so. fun. And it's good for me, too. You laugh, but I am definitely sweating and achieving my target heart rate when I'm Just Dancing. Players can dance on their own, or in groups of up to 6 dancers, but there's also something called the World Dance Floor, where people from around the world are all dancing to the same song at the same time. And competing, I guess. But I don't pay too much attention to the scores. I just dance. Like nobody's watching. Because nobody is. I'm pretty sure vigorous exercise helps with circadian rhythms, too. And that's my new morning routine. Oh. After the World Dance Floor, I head to the kitchen for breakfast, usually a one egg omelet with crumbled bacon and melted cheddar cheese, and then I hit the shower. I am loving the spiritual, emotional, and physical boost that comes from following my morning routine. It's a little unconventional, but who can argue with results? And those endorphins. So tell me: what's your morning routine like?